Mojang co-founder Jakob Porser says Scrolls could become a free-to-play game if the number of players doesn't start to pick up. A couple of years ago, Minecraft creator and Mojang co-founder Markus "Notch" Persson made it clear that he is not a fan of free-to-play games. "The reason anyone switches to 'free to play' is to make more money. You get your players hooked on your game, and then you try to monetize them," he wrote on his blog. "The idea is to find a model where there basically is no cap on how much the player can spend, then try to encourage players to spend more and more money. Various psyhological traps like abusing the sense of sunk costs get exploited, and eventually you end up with a game that's designed more like a slot machine than half-life 2." Nonetheless, Mojang co-founder and Scrolls lead designer Jakob Porser said that game, which is currently available as a "paid beta," may take the free-to-play route if player numbers don't start to grow. Scrolls has put out roughly 110,000 copies at €15 ($20) each, but 100,000 of those sold within the first month of its early June release. That stalled user base has Porser considering a change in approach. "We never want to make a game that sells lot of expensive things just because there are people who are willing to buy them," he told Swedish site IT24. "However, we do not close [the door] for making Scrolls a free game in the future if needed to attract more players." 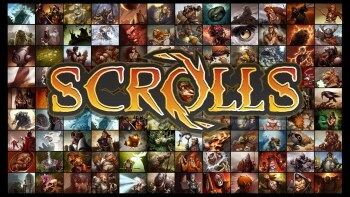 Porser said that between three and four thousand people play Scrolls every day, which isn't quite enough to ensure that players will consistently be able to find opponents of appropriate skill. "We have absolutely no plans to become free2play in the near future, but we notice that it eventually becomes difficult to attract enough players so it can definitely happen," he said. "That is how most other collectible card game works today, it may have already become a standard that many expect that this is how it should be." Porser added that Mojang is continuing to work on Scrolls' single-player mode but said that no target for completion has been set because, with all the Minecraft money coming in, the studio doesn't have to worry about deadlines.